Who doesn't like cheese and crackers? Well, perhaps people who are lactose intolerant have a problem with it, but I don't. 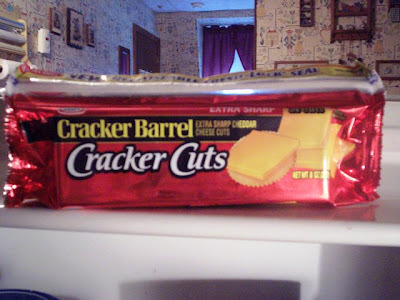 That's why I love the Kraft Cracker Barrel Cracker Cuts. I've seen two different varieties of the cheddar cheese, but Mom bought the extra sharp this time. These small squares (24 in each bag) come separated by a thin sheet of paper and are just big enough to fit on a Ritz or Saltine. THE VERDICT: Delicious! I love things that you don't have to work at. There is no slicing, dicing, cutting, hurting yourself while cutting, or any of that nonsense. You just open the recloseable fresh-lock seal, whip out a square of cheese, slap it on the cracker, and you're good to go. This is great if you have people coming over and you want to put something out for them. The taste is delicious, but the price is a little on the high side (Mom said that the regular price is about $3.59). Thankfully, they were on sale this week for $2.50.